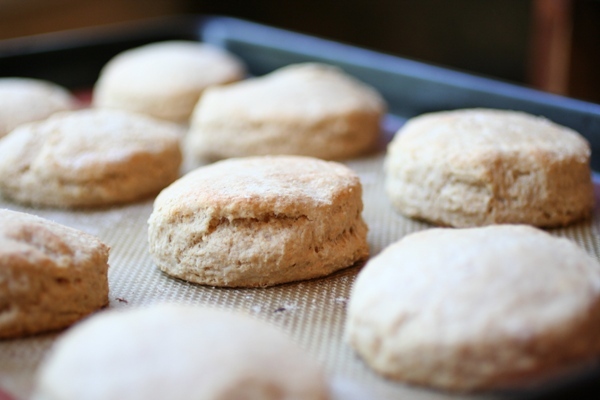 Okay, so I absolutely love homemade biscuits, but they don’t exactly fit into our clean eating plan these days. What is a girl to do? Create a version that does fit! I made some modifications, namely whole wheat flour (fresh milled) and butter instead of shortening. I have to say, these aren’t bad…not bad at all. But, do you know what the best part is? They only take about 5 minutes to make (Seriously! 5 minutes!) and 10 minutes to cook, so you can have them ready in 15 minutes. That is less time than it takes me to get out the door to go to Cracker Barrel. 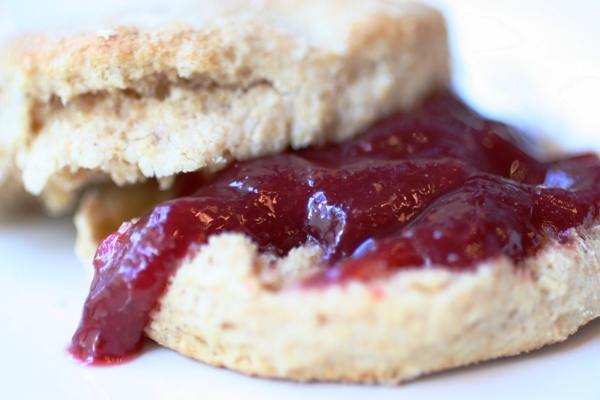 Oh… and this is the best way to eat a homemade biscuit… smothered in butter and homemade strawberry jam. Technically this is still clean eating, it’s organic butter and homemade strawberry jam! Variation: Add 1-2 tablespoons of sugar and your favorite add ins like dried blueberries or mini chocolate chips and you have a delicious scone recipe! Sift dry ingredients together in a large mixing bowl. Add cold butter and mix using a pastry cutter or put into a food processor, until butter is combined in bits, like coarse meal. Press or roll out to ½ - 1 inch thickness, then cut using your favorite biscuit cutters. Bake for 10 minutes or until slightly brown. Serve covered in butter and your favorite honey or jam. Your biscuits look amazing! What type of mill do you use? I was thinking of getting one and wanted to choose the right one the first time since they are so expensive. I have a Wonder Mill Electric Whisper Mill and I LOVE mine. We use it every time I bake, which is a few times a week. Thanks, Kelly! 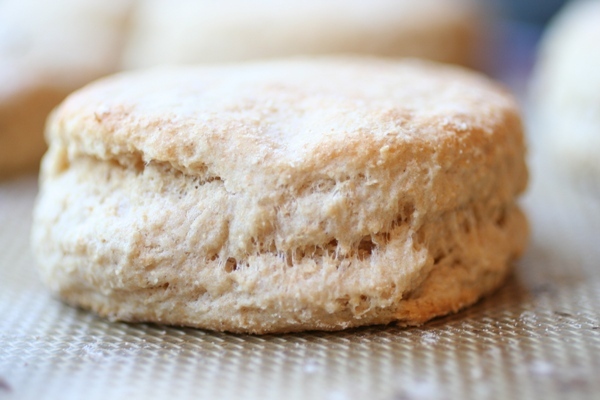 Homemade biscuits are a favorite of mine, too. My favorite is homegrown, sliced tomatoes and biscuits, with butter. Yum! I will be able to say I’m not being as “bad”, using your recipe. Thanks! Oh, that sounds amazing. I have an addiction to homegrown tomatoes, I can eat them with a salt shaker in hand, like an apple. I am going to give these a try. In the past, I have used the food processor to mix dry ingredients and cut in the butter. I have made batches of the mix and stored them in ziplock bags in the fridge for as long as the date on the butter. When I want to make a batch, I add the wet ingredients and bake – works for me! These are my new favorite! 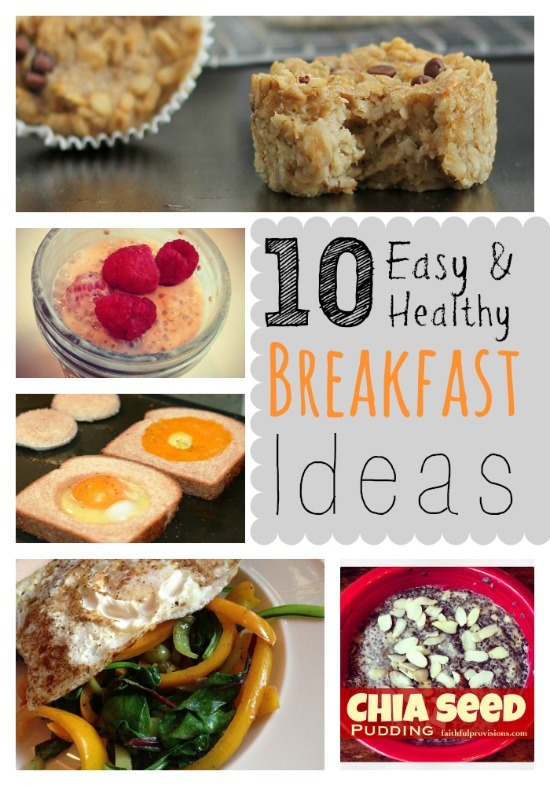 Good for breakfast, snack or after dinner treat. 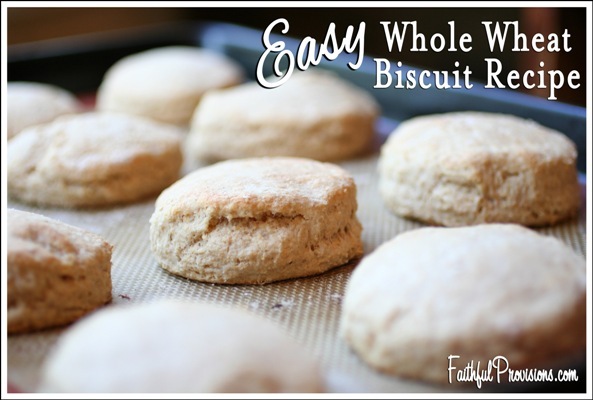 These were great for whole wheat biscuits. Super easy! The exterior was a little crunchier than i wanted… i’m not sure why… maybe because they cooked too long but the interior was fluffy and yummy! Thanks!! Thanks so much! They smell Amazing. These turned out great!! Only had stone ground whole wheat flour so they were a little coarse but aim to buy the recommended flour next. Also used greek yogurt. Thanks for sharing, we needed a new and better tasting biscuit!